NextLife in the fast lane: Death of James Dean. When you hear a voice like Courtney Marie Andrews, it’s hard not to feel moved by its strength and remarkable maturity. Her new song Hearts and Mind is a case in point, swept up with gut wrenching emotion but also empowerment as Andrews tells women worldwide “You’re more than a body/ You’re a heart and mind”. Interestingly her expressiveness is not limited to just this one song, you can go back a decade to discover how Andrews’ music reminds us about our human vulnerabilities, but also our strength and kindness. Andrews, may have country in her roots but it did not stop me from discovering her acclaimed album Honest Life (2016) a few years ago. When I pause and look back at Honest Life, what I adore most about it is Andrews’ songwriting flair, especially her folk sensibility in telling stories that we can all relate to and it didn’t matter whether it was about longing or regret. More recently, Andrews’ latest album May Your Kindness Remain (2018) has been glued to my record player needle. Honestly, it wouldn’t surprise me if it ends up topping several lists as one of this year’s best albums. And so, with May Your Kindness Remain particularly on my mind, I reached out to Courtney ahead of her run of tour dates here in Australia (beginning next week), hoping to unravel maybe one or two new surprises. Here is some of what we talked about. I discovered your album Honest Life a few years ago and I especially love the title track and your song called Only In My Mind. More recently I really got into your new album May Your Kindness Remain. What is different about these new collection of songs compared to those from Honest Life? May Your Kindness Remain and Honest Life are very different. I’m very interested in creating collections of songs, both sonically and lyrically, that are of a time and place yet timeless. Honest Life was made from a place of desperation to make something real and true and speak very introspectively about my life at the time. May Your Kindness Remain feels bolder and more extroverted and passionate, even when the songs are referring to depression. I felt very different while making both. I’m not interested in making the same record twice! Took You Up is one of my favourite tracks from May Your Kindness Remain. Can you tell me something surprising about it? I almost didn’t finish that song. I wasn’t in love with the idea at first, but then I played the first verse and chorus for a friend and she asked, “what is THAT song?” It gave me the confidence to finish the song and see the beauty of the idea from another’s perspective. It’s a song that is very personal to me, which is possibly why I felt unsure about it. If you had to pick one song from May Your Kindness Remain as your favourite, which one would it be? And why? I try and make entire albums I’m proud of, but the song “May Your Kindness Remain” was a benchmark for me. I love writing big idea songs that every person can relate to and I felt that I really caught one in that tune. The familiarity of your songwriting, the sound, the melodies and especially your voice has a real charm to it. That said we also see you transverse across an array of settings and emotions. What is it that sets your music apart from others? Thank you. I can’t say exactly! All I know is that I try my best to draw from many of my influences and try and stray away from making anything that’s too derivative of a certain genre. You have a knack of chronicling what is happening around you in your songwriting. Is that a deliberate or subconscious thing on your part? I love photography and try to write the same way as when you look at a photograph. I love to evoke a feeling with imagery in my writing. I am very much drawn to that style of writing. Back in an interview earlier this year you said “I’m an old man when it comes to music”. I think you were referring to an elite group of old school musicians which include Neil Young and Joni Mitchell as your influences. Could you elaborate here on just one musical hero and why they are so important to you? I feel there is so much to learn from our elder musicians. They carved the path, and it’s our jobs to reinvent that. So, I find myself coming back to those records quite a bit. Bob Dylan is the master of a song, and he’s an artist I never seem to stop learning from. Forgive me, in that same interview you also referred to songs as having no gender. Could you explain that a little further for me? I love the idea of that. I probably meant that I can take the form of any character I want in a song, from any perspective. Songs don’t have to be limited to your personal perspective. People’s perceptions about women in music are continually evolving and for the better, I hope. I understand in the past you have been underestimated and it has often felt like a running battle. The recognition you are receiving now has a funny way of shutting up a lot of people. What are some of the things that have improved around you? Does it annoy you that its taken success for them to shut up? I feel that more women in the music industry are taking more of a vocal stand on these issues. It’s very inspiring. There will always be ignorant and patronizing comments made towards women in this business whether you’re successful or not. The only thing I can do is take those hits to heart and build those into strength. I can do that and speak my mind. I hope that one day those ideals and standards aren’t even a thought or question. You’ve been to Australia regularly over the last twelve months or so. We are absolutely thrilled you are returning again. What is it about Australia that keeps you coming back? Australia is beautiful. It feels like vacation touring there and the crowds and people are so fun! My great promoter, Love Police, is kind enough to keep me coming back. What can we expect from you this time around with your new shows? I’ll have an array of new songs! 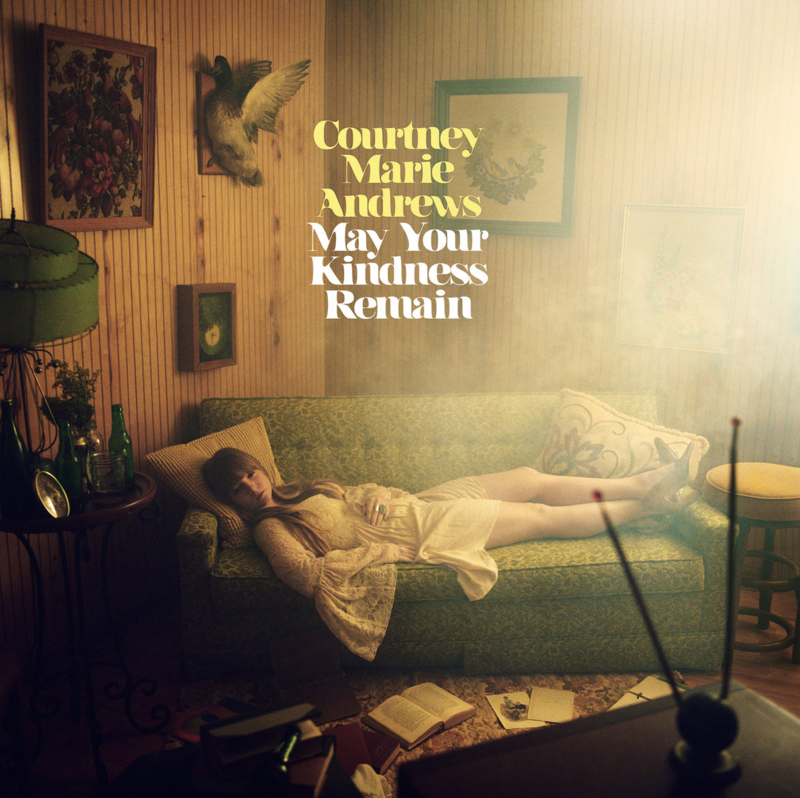 Courtney Marie Andrews’ May Your Kindness Remain is available in all good record stores and digitally. Also check out Courtney Marie Andrews’ back catalogue via her music store. You can also follow Courtney via her Facebook page or Twitter feed. Follow her on Instagram. Watch her on You Tube. Tuesday 9 October / Spotted Mallard, Brunswick, VIC. Wednesday 10 October / Caravan Music Club, Melbourne, VIC. Thursday 11 October / Winnebago Lounge @ Caravan Music Club, Melbourne, VIC. Friday October 12 / Lefty’s Old Time Music Hall, Brisbane, QLD. Sunday October 14 / Noisy Ritual, Brunswick East, Melbourne, VIC. Tuesday 16 October / The Factory, Sydney, NSW. Photo credit: The header image of Courtney Marie Andrews is photographed by Laura E. Pertain and supplied by Inertia Music. I am not the uploader of You Tube clips embedded here.